Shepherd’s Company has been serving residential and commercial customers in Missouri since 1979. As a well-regarded services company, we strive to do our best for our many valued customers. In our workers, we value a strong work ethic, integrity, honesty and motivation. Our work is fast-paced and rewarding–jobs done well do go not unrecognised. We maintain a friendly yet professional work environment with a group of partners and employees who work together as a team to complete jobs to our customers’ satisfaction. 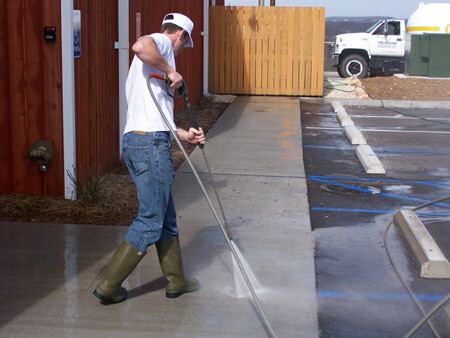 Our customers range from well-known and local stores and restaurants to banks, industrial buildings, government offices, and major US retailers, as well as many homes and condominiums we are privileged to serve in Columbia, Jefferson City, The Lake of the Ozarks, St. Louis (via our AllSeal Powerwash division) and many other cities throughout Missouri. Our positions include field service work and crew/route management with challenging physical work, as well as a group of experienced workers who are implementing new and cutting-edge systems, processes, equipment and technology in the field and office. If you are motivated, clean-cut, customer-service and/or sales oriented, physically fit and know when to work smarter not harder, please consider applying for a position with us. We offer hourly wages and opportunity for commission, bonuses and advancement. Several leading service companies in other cities have been started from those who were trained at Shepherd’s Company. On-the-job training is provided, including safety measures and precautions. We do conduct background screening and drug testing. Established, growing and dynamic services company is seeking to fill a full-time field service position for pressure washing and window cleaning. Responsible and dependable person needed to handle serving important accounts for our company. Professional, yet friendly work environment. Training is provided. Great opportunity for the right person. We’re seeking top service professionals who are highly motivated. Must have a good driving record and be able to pass background check. We are hiring an employee with some carpentry and painting experience, who, while supervised, can start, oversee and complete assigned jobs for residential and commercial contracts. You will usually work as part of small crews. Please be dependable and flexible, and able to present a good image to our customers. Positive work environment. This is not an entry-level position. We do conduct background and drug testing. Pay depends on experience.